Super easy to make and infinitely adjustable, you can’t go wrong with a slaw like this to top burgers (try it on my Thai Chicken Burger) or serve on the side of any dish with Asian flavors. Maybe Kabobs or Chicken Breast. 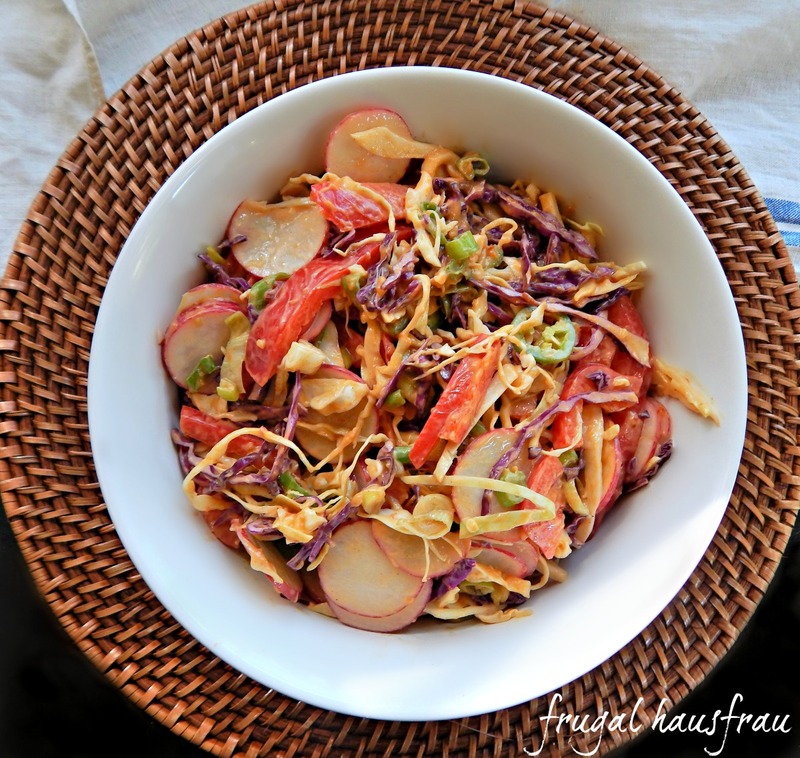 Any Thai Slaw leftovers can be tossed with cooked Ramen (or other noodles) for a fun little noodle salad twist. Maybe for lunch the next day? Cabbage (good old cheap cabbage – it’s so healthy and such a workhorse in recipes) anchors this slaw, but from there on it’s up to you. Add in what you love. And what you enjoy. When buying cabbage, or any vegetable, check to see if the price is per pound or per item. If per pound, buy what you reasonably need, but if per item, always choose the largest. Cabbage keeps a good long time, even if cut. If there’s discoloration on the edges or outer leaves, cut or pull off to reveal perfectly fine cabbage underneath. For dressing, mix all ingredients together. Thin with a little water if too thick. Taste and adjust any seasonings. For the slaw, mix all vegetables together. Top with the dressing and toss. Serve within an hour or two for the most vibrant slaw. Note: If making Thai Chicken Burgers, you may wish to use the smaller amount of vegetables and set aside a few tablespoons of the sauce for those that don’t wish to top the burgers with the slaw. I’ll be bringing this recipe over to Fiesta Friday #180, hosted this week by Tracey @ My Baja Kitchen and Jhuls @ The Not So Creative Cook. This entry was posted in Click here for Fabulous Food Posts and tagged Asian, Bell Peppers, Cabbage, cabbage slaw, Carrots, Frugal Hausfrau, Green Onion, Hot Peppers, Peanut butter, radish, Salad, Side, Slaw, Thai, Vegetable Side. Bookmark the permalink. Perfect summer food. My husband often has a spoonful of peanut butter when he is too busy to make a proper lunch, and I am not around. Us as well. The routine includes 6 am…out to do their business…7 am breakfast…out again…8 am kong with peanut butter. I buy it in the largest jars possible. We share…although I do not double dip. Sounds great– love love cole slaw!! Stay cool! hugs! I may not be a huge fan of peanut butter, but when it comes to peanut dressing or any Thai food, I’d definitely take it! This looks absolutely delicious, Mollie! Thanks for sharing at Fiesta Friday party! If you haven’t whipped up something with that peanut dressing or some variation, you’ve been missing out. And thanks! Thai dishes are one of my fav and this recipe sounds fabulous! I could eat this forever! Another one to add to my list Mollie! It’s going awesome, thanks Mollie! Mollie, as soon as I saw peanut dressing . . . I am so in love with peanut butter. I can eat a spoonful straight out of the jar! This is definitely a recipe for me to stash away for summer. Our weather is horrible at the moment – raining and cold! Oh, I wish I were there! Wanna trade for a week or two? I love peanut butter, too. And yes, I’ve been known to take a spoonful or two! I always think I’ll just take a little taste and put just a wee bit on the tip of the spoon. But then there’s that second bite. And that moment of consternation – do I get a new spoon or just go for it, lol! When I’m home (I live by myself now) I don’t worry about it so much, but when I’m at my folk’s, then it’s a different story, haha! Don’t tempt me, Mollie! Weather is horrible here again today. But the weekend is looking brighter. Just as well! Love love Thai! Will check out the burger recipe. Peanut butter isn’t something I’d ever think to add to a dressing but I guess it’s similar to using a tahini dressing to dress one of the buddha bowls which are popular. Well there are “real” peanut sauces where you buy, peel and roast the peanuts and I think they’re quite a bit more potent than these Asian American versions. But either is wonderful!